Figure 1. Buildera CRACKMON® crack monitor tracks changes in crack width of this petrified tree trunk at the Florissant Fossil Beds National Monument in Colorado. Photo credit: Lynn Bashaw. Destructive earthquakes compromise structures, risking human casualties. Occupant safety, business continuance, and mitigating financial liability underscore the urgency for proactive crack monitoring in high-risk seismic zones. A CRACKMON® is a cost-effective crack monitoring device that measures the horizontal and vertical progression of cracks in building foundations, walls, floors, ceilings, load-bearing supports, and historic monuments. Affordable and easy to install, property owners, forensic engineers, and government officials accountable for residential, commercial, and institutional structures should factor routine crack monitoring into a proactive occupant safety and building-maintenance regimen. Part I of this white paper examines earthquake hazard risk, safety, and the economic rationale for preventive crack monitoring. 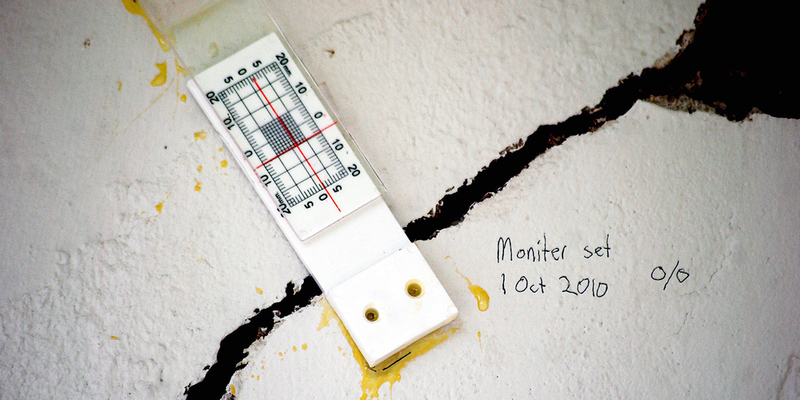 Part II discusses crack monitoring tips and techniques, presenting simple tools and best practices for measuring and documenting cracks before and after seismic events. 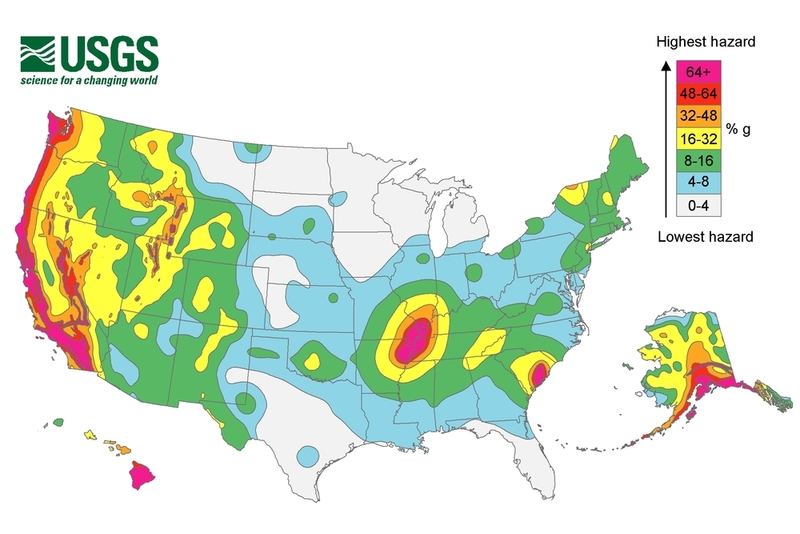 Whether to improve occupant safety, mitigate structural failure of homes and buildings, or to document liability for insurance and legal claims, proactive crack monitoring is gaining adoption in seismic regions across North America, including along the West Coast as well as the New Madrid Seismic Zone in the Midwest. Figure 2. Long-term crack monitoring of an old masonry structure. Photo credit: Jason Church, Conservator, National Park Service. Evidence from small and large quakes globally points to strict building codes, enforcement, and preparedness as key factors in mitigating injuries, fatalities, and structural losses . Moderate to large quakes in countries such as Haiti (2010 7.0M, 315,000 deaths), China (Tangshan, 1976 7.5M, 242,000 deaths), and Turkmenistan (Ashgabat, 1948, 7.2M, 110,000 deaths) caused mass destruction and hundreds of thousands of fatalities . In quakes like these, unwitting inhabitants were no match for lax building codes, unreinforced masonry and concrete, or even corruption among some unscrupulous contractors and building officials . Yet with so many uncontrolled variables, strict building codes alone are insufficient to preclude all human casualties or prevent damage to even the best engineered structures. Early detection and proactive maintenance of structural cracks is key, particularly with older edifices or other structures built on unstable soil that lack the benefit of contemporary seismic design. Foundation tie-downs, shear-wall bracing, metal strapping, adequate steel reinforcement, and pier foundations add essential structural integrity to new and existing structures. Identifying and monitoring structural cracks before an earthquake leads to improved awareness of building conditions that might otherwise pose threats to building integrity and occupant safety. Proactive low-cost monitoring of structural cracks provides an early hazard warning and helps property owners to identify areas for deeper inspection and remediation. Moreover, crack monitoring is also useful in understanding the effects of soil conditions on foundation performance, which is not limited solely to seismic regions. For example, clayey soils are highly expansive and are implicated in many foundation and structural issues across the country. Ground subsidence, such as is common in the Las Vegas valley due to excessive groundwater pumping, is increasingly common . Such conditions prematurely stress foundations and structures, making them more susceptible to failure during a major earthquake or other natural disaster. Compounding the risk, structures built on reclaimed land are particularly vulnerable to soil liquefaction, which occurs in many coastal areas where limited land and high demand for waterfront property drive premium prices. During a seismic event, shock waves can temporarily turn landfill and reclaimed wetlands into a fluid, plastic state, undermining the strata supporting the structure. As the ground heaves, so does the structure, often with catastrophic results. High-risk areas include the Marina district in San Francisco, California, as well as other commercial and residential developments along the bay front, such as Foster City, Redwood Shores, Alameda, and parts of Oakland, for example. As the USGS Seismic Hazard Map in Figure 4 shows, earthquake risks in the US are widespread, albeit certain regions are more susceptible than others to strong ground acceleration. Generally, the highest hazard zones include numerous faults up and down the populous West Coast of North America, including the well studied San Andreas, Hayward, and Cascadia faults—the latter being a subduction zone stretching from Northern California to British Columbia, Canada. Additional risk areas include the Sierra-Nevada mountain range stretching 400+ miles along the California-Nevada border. Alaska (1964, 9.2M), and the big island of Hawaii (1868, 7.9M), also face serious threats and have produced very large earthquakes in recorded history, although these areas are less densely populated with fewer lives and structures at risk. Figure 4. US Seismic Hazard Map. Higher numbers denote risk areas likely to experience significant structural impact during a moderate to major seismic event. Graphic Credit: U.S. Geological Survey Department of the Interior/USGS. Less well known, but equally concerning is the New Madrid Seismic Zone that covers a massive swath of the Midwest and South threatening seven states, principally Illinois, Indiana, Missouri, Arkansas, Kentucky, Tennessee, and Mississippi. Due to the lack of a large-scale event in recent memory, building codes in these areas typically trail behind the stricter West Coast standards. A large quake along this fault would be catastrophic, particularly to unreinforced masonry buildings and older civil infrastructure that are common throughout the region. The last large quakes within the New Madrid Seismic Zone occurred in rapid succession during 1811 and 1812, producing estimated magnitudes between 7 and 8+. Ground shaking rocked cities as far away as Washington DC and beyond, trembling the eastern third of the continental US. Figure 5. Massive crack in concrete wall. Photo credit Michael Beckwith. Globally, there are over 1,300 quakes 5.0M or above in a typical year. Quakes over 6.0M occur nearly once every three days. Seismic events 7.0M and above are less frequent, but typically occur more than once a month. Massive quakes 8.0M and above occur as few as zero to as many as four or more times per year . Even moderate quakes, such as the 2011 Christchurch, New Zealand quake (2011, 6.3M) conveyed extensive structural damage to homes and businesses. Although many quakes occur in remote areas, history shows that even moderate quakes can produce significant structural damage and loss of life when situated near populated regions. However, with much of the media attention focused on recent massive quakes in other countries, US quakes measuring 5.0M or above occur between 25 to 100 times per year. Earthquakes registering just 5.0M or more are potentially damaging, even where strict building codes and enforcement prevail. Given the certainty that a damaging quake will impact a populated area, little more proof is needed to warrant crack monitoring of existing structures to identify shifts before and after a seismic event. Potentially millions of structures situated in seismically active regions in North America and globally could benefit from such vigilance. Figure 6. Structural cracks in concrete wall. Photo credit: Sherrie Thai. The 6.0M Napa, CA quake (2014) on a lesser known fault caused extensive damage to historic buildings and wineries, with damage estimates between $500M to $1B, including over 30 red-tagged structures. The 5.1M La Habra, CA quake (2014) underneath the Puente Hills thrust fault caused significant damage to a number of structures and apartments, resulting in red-tagged domiciles. The 6.7M Northridge, CA quake (1994) caused widespread damage across the greater Los Angeles basin, killing dozens and injuring thousands. Losses are estimated to be $49 billion or more. In Northern California, the 7.1M Loma Prieta quake (1989) along the San Andreas fault killed 62 people, injured over 3,700, and caused billions in damage to homes and high-value structures. Major structures collapsed, including freeways and a segment of the Bay Bridge connecting San Francisco to Oakland. 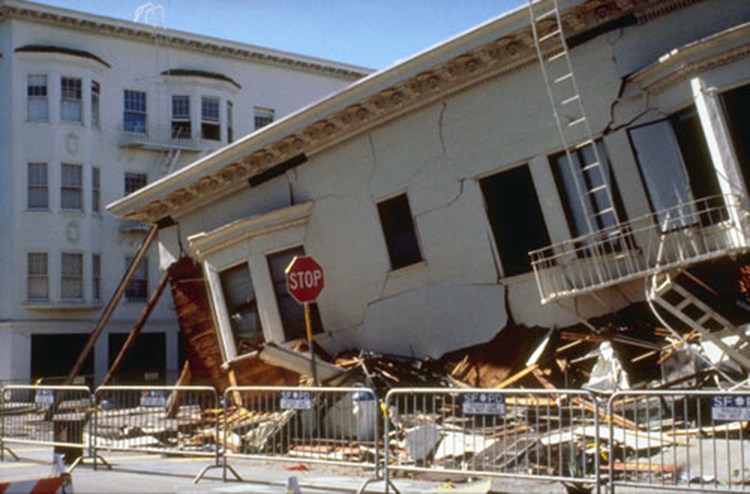 Several homes were destroyed in Santa Cruz and north in San Francisco where unstable strata amplified shockwaves, causing soil liquefaction and subsequent foundation failure. This was the largest Bay-Area quake since the great 1906 San Francisco quake that destroyed much of the city from resulting fires. While seismic crack monitoring will not prevent an earthquake, it calls attention to existing conditions that could deteriorate over time, including premature corrosion of reinforcing steel due to moisture exposure. These leading indicators allow property owners the opportunity to take remedial action before it’s too late. At the very least, for just a few dollars, property owners now have the ability to assess changes in structural cracks before and after a potentially damaging seismic event. Figure 7. Pre-existing cracks are ideal candidates for continuous structural monitoring before and after seismic events. Photo credit: Joseph Schneid. Figure 8. Monitoring a pre-existing crack for new changes. Photo credit: Angie Shyrigh. When assessing risk, it is difficult for the untrained eye to discern the difference between a cosmetic crack and a structurally significant crack. 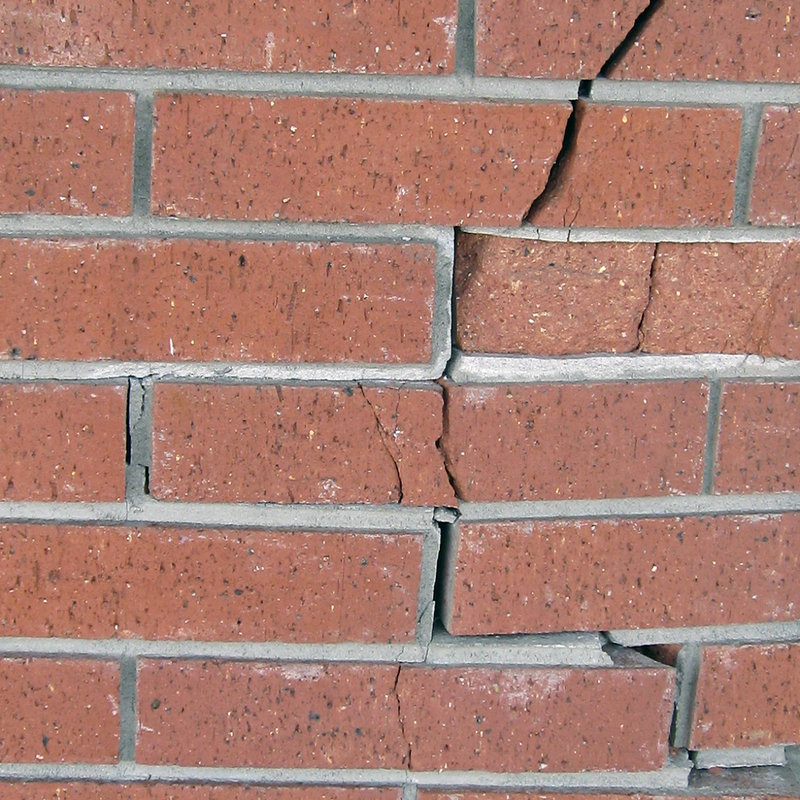 Small shrinkage and tension cracks are common in most foundations and structures. Concrete is weak in tension and strong in compression, which is why steel reinforcement is mandatory to strengthen concrete along the long axis. Soil expansion, contraction, and minor settling cause many hairline cracks that have little imminent structural or occupant safety significance. However, when subjected to excessive ground thrust forces, these cracks can worsen after a moderate to large seismic event. The only way to assess changes in pre-existing cracks is to monitor and document changes before and after a seismic event. Without pre-monitoring, once the event has transpired, there is no way to know how much shift has occurred without a baseline for comparison. Furthermore, without pre-inspection and written documentation, the property owner may not know which cracks were pre-existing or new. This evidence can be particularly important for insurance claims and supporting documentation. Figure 9. CRACKMON® crack monitor tracks structural changes of the historic Martinez Adobe situated in the John Muir National Historic Park in Martinez, CA. 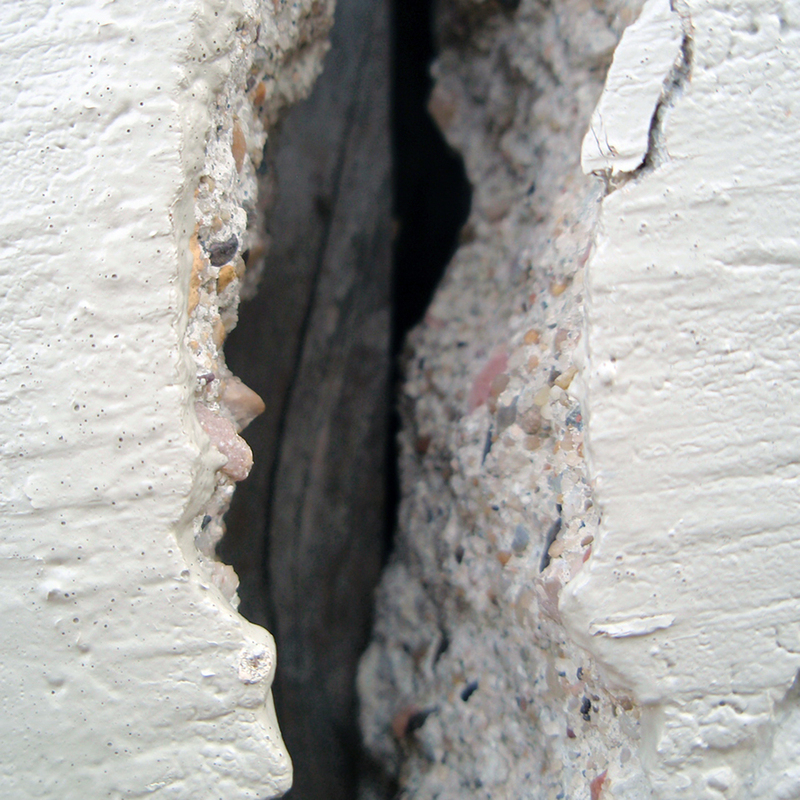 Based on the installation and photo dates, the crack widened by 6 mm and 2 mm laterally in nine months. The site is approximately 10 miles from the Hayward, California fault. Photo Credit: Paul Sullivan, under license of Creative Commons. Figure 10. CRACKMON® 224R Crack Width Trend Chart documents crack progression over time. Click image to expand size. Acrylic crack monitors such as the Buildera CRACKMON® 2D are inexpensive two-piece gauges that provide peace of mind and critical data before and after a seismic event. Available online in complete DIY kits, the CRACKMON® measures small changes along two-dimensional X (horizontal) and Y (vertical) axes of a structure with a typical +/- 0.5 mm resolution and displacement range of up to +/- 20 mm horizontally and +/-10 mm vertically. Knowing how much a crack changed is essential to assessing the damage profile . For about $20 per crack measurement (excluding labor to install), these devices are cheap insurance considering the incalculable value of human life and structures they protect. A nominally skilled homeowner or property manager can install a CRACKMON® crack monitor in under 15 minutes without professional help. Optionally, a handyman, contractor, or licensed structural engineer can provide a service to install and monitor such devices on behalf of the property owner. To establish an initial crack displacement baseline, the Buildera™ CRACKMON® 224R Crack-Width Comparator provides graduated crack widths from .004" to .140" (0.10 mm - 3.56 mm) and beyond, including seven crack widths that conform to the American Concrete Institute ACI 224R-01 standard for reinforced concrete . For under $15 street price, this pocket-sized crack gauge fits easily in a wallet and simplifies quick assessment of new and pre-existing cracks. The crack-width progress chart shown in Figure 10 improves visual understanding of crack progression over time, including after a seismic event. 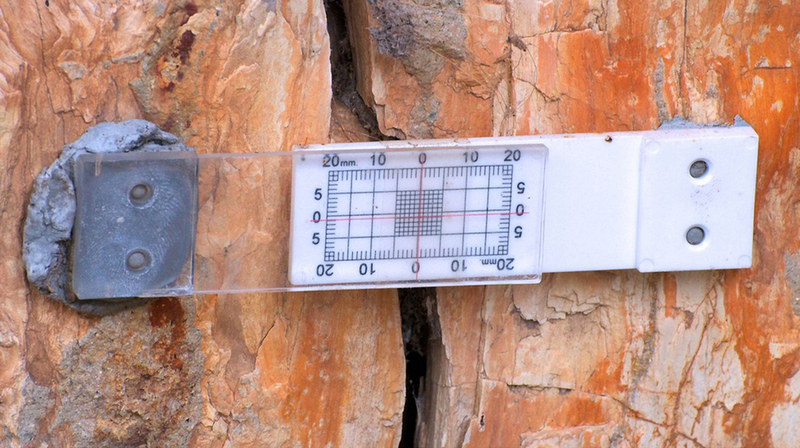 Maintaining accurate logs provides essential data for geotechnical, structural, and forensics scientists. Figure 11. This brick facade is a good candidate for structural crack monitoring. Photo credit: Sherrie Thai under license of Creative Commons. More sophisticated crack monitors measure differential movement along three axes. The Buildera™ CRACKMON® 3D™ is an engineering-grade all stainless-steel structural crack monitor with permanent laser etching. This device measures X-, Y- and Z-axis displacement, with visual discrimination as fine as +/- 0.5 mm in all directions. Inside and outside corner-mount units are also available for cracks located near an interior or exterior corner. A quality digital caliper such as the Mitutoyo 500-196-30 Advanced Onsite Sensor Absolute Scale provides even finer discrimination when used in conjunction with the CRACKMON® 3D visual inspection method. 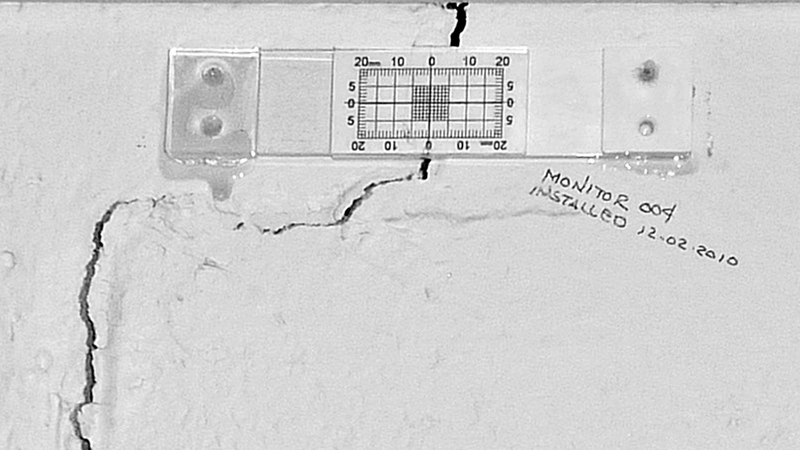 When monitoring pre-existing cracks, such as in concrete foundations, basements, retaining walls, stucco, masonry, and interior partitions, install at least one CRACKMON® crack monitor over the existing crack and anchor into place using an engineered thixotropic epoxy (such as Buildera StruPoxy™ 8101-5 Structural Epoxy Kit) or fasten with an approved anchoring system using tamper-resistant #6 stainless-steel sheet-metal screws. Thixotropic epoxy is viscous and avoids sagging during installation on vertical surfaces. With initial set in just five minutes, this is one of the simplest methods for the do-it-yourself installer. It requires only basic tools, such as an epoxy mixing stick, 6" torpedo level, duct tape, and a utility knife. Conversely, the fastener method requires a rotary or SDS-plus hammer drill and 3/16" concrete bit to drill four 1-1/2"-deep holes for approved Toggler® Alligator AF5 anchors. The benefit of this fastener method is ease of crack monitor re-use, as well as the option to substitute Phillips or hex-head screws with corrosion and tamper-resistant stainless-steel security screws. Buildera has field tested many anchor types and found most to perform inferior to the approved anchor. In extreme cases, both the epoxy and anchoring methods may be combined for a permanent, lasting, tamper-resistant installation (refer to Buildera CRACKMON® installation instructions for more details ). Long cracks that run several feet may require multiple monitoring points, as crack width can vary depending on the forces at play and position and amount of steel reinforcing. Figure 12. Buildera CRACKMON® TraCard™ 3D Front View. For illustration purposes only. Figure 14. Buildera CRACKMON® TraCard™ 3D Rear View. For illustration purposes only. Once the CRACKMON® is installed, always establish baseline readings for future reference. Observe the initial displacement and transfer the X-Y coordinates onto the front side of the CRACKMON® TraCard™ 3D Crack Documenting System . On the reverse side of the TraCard™ 3D, document the environmental parameters using the space provided. Rather than scribbling notes on the foundation wall or scraps of paper subject to damage and loss, the TraCard™ 3D helps property owners and engineers systematically document and archive changes over time, including before and after a potentially destructive seismic event. Changes in crack displacement after minor quakes is an indicator of structural impairment which, if left unattended, could become catastrophic in a much larger quake. If using the Buildera CRACKMON® 3D crack monitors, the TraCard™ also includes space to document changes in Z-axis offset, in addition to X-Y displacement. The Buildera TraCard™ 3D measures 2.0 x 3.5 inches, the same size as a standard US business card. Using archival-grade Avery 76009 Business Card Pages, insert up to 10 completed TraCard™ 3D per page and store in a quality three-ring binder. This best practice helps to organize and identify changes in crack progression versus time. This is particularly valuable when comparing cracks before and after a seismic event. For convenience, Buildera offers complete crack documentation accessory kits, including a TraCard™ 3D polypropylene case, TraCard™ 3D refills, three-ring clear card pages, and industrial Sharpie® marker. The marker and premium paper coatings form a durable chemical bond that is water resistant and offers excellent long-term archival properties. Accelerated salt-water laboratory tests for 72 hours show no ink smearing or loss of legibility when a TraCard™ 3D is immersed fully in a 1000mL beaker with a stirring rate of 100 RPM. Figure 16. Impaired stucco stress fracture. Photo credit: Sherrie Thai. In situations where new cracks or previously undetected cracks are visible after a seismic event has already occurred, begin monitoring immediately. For this reason, it is advisable for structural engineering contractors, forensics specialists, and government agency emergency services to stock crack monitors for immediate use after a quake in damaged or red-tagged structures. Although there may be no baseline for comparison, quakes tend to cluster in time. A smaller quake may portend a larger one in the near future. And certainly sizable aftershocks typically follow the larger quake. Aftershocks may number in the tens or hundreds or more. The foreshock or quake itself can weaken a structure, only to fail during one of the many aftershocks. Depending on the quake magnitude, aftershocks will occur for days, weeks, months, and even years after the catalyst event. In as many as 5-10% of the cases, sometimes the initial event is a precursor to a larger event, which gives the property owner an opportunity to act immediately to identify future structural impact. The clear message is that crack monitoring should commence at the first sign of structural cracks, particularly in load-bearing foundations, reinforced slabs, retaining walls, floors, and ceilings. The larger the existing crack, the more likely that part of the structure will succumb to further damage during a moderate to major seismic event. Mechanical crack recording systems, such as the Scratch-a-Track described by Bungey et. al. provide a convenient means of permanently recording crack motion 24x7 using a patented "scratch-off" technology . Buildera markets this technology under the CRACKMON® ScratchMark™ brand. Figure 17. Electronic crack-width monitoring. Photo credit Joan Monaco. Electronic crack monitoring solutions are beginning to appear on the market that leverage a range of sensor and data logging technology, including wireless communication networks. While very powerful, these techniques tend to be much more expensive to procure and install (typically hundreds or thousands of dollars per crack), and usually require a reliable source of power as well as internet or cellular data connectivity. Each axis requires a dedicated sensor and logger channel. During a major event, the power may become disrupted, in which case battery-backup is critical to continue logging for before/after changes. Or, internet/cellular service may become inaccessible for a period of time, making it difficult to retrieve readings remotely. While these methods become practical for very high value structures where the cost of installation, maintenance, and on-site monitoring are small in comparison to the structure’s value, most homeowners and property managers cannot afford to purchase, install, and manage such sophisticated devices. This is why low-cost 2D and 3D CRACKMON® crack monitors are so compelling for the millions of structures at most risk. A lay person with minimal training can install a crack monitor and inspect changes periodically along with other property maintenance routines. When used in conjunction with CRACKMON® crack monitors, the TraCard™ 3D Crack Documenting System provides a consistent method for collecting data, documenting it, and storing it for later comparison. The TraCard™ 3D (or entire pages of TraCards) may be scanned or photographed and stored in the “cloud” using a file service provider, such as Box, DropBox, iCloud, Amazon or Google Drive, for example. With the prevalence now of mobile-phone cameras, documenting cracks and preserving critical structural data has never been more accessible to home owners, property managers, and geotechnical engineers. Greg Lowitz is the founder of Buildera and Builders Websource, based in Redwood City, California. He holds BS and MS degrees in engineering from Stanford University and two US patents in the field of image processing. He frequently consults with homeowners, architects, and engineers on best practices to improve structures for better living, health, and safety. The author is grateful to Lynn Bashaw, Angie Shyrigh, Jason Church, Michael Beckwith, Sherrie Thai, Joseph Schneid, Paul Sullivan, Joan Monaco and the U.S. Department of Interior, US Geological Survey (USGS) for associated publishing rights. DeKorn, Clayton. "Have Strict Building Codes Saved Chile?" The Journal of Light Construction. Hanley Wood Media, 13 Apr. 2014. Web. <http://www.jlconline.com/building-codes/have-strict-building-codes-saved-chile_o.aspx>. "Earthquakes with 50,000 or more deaths (USGS). ", USGS.gov. USGS. Web. <http://earthquake.usgs.gov/earthquakes/world/most_destructive.php>. Lim, Louisa. "Five Years After A Quake, Chinese Cite Shoddy Reconstruction." NPR.org. NPR, 13 May 2013. Web. <http://www.npr.org/blogs/parallels/2013/05/14/183635289/Five-Years-After-A-Quake-Chinese-Cite-Shoddy-Reconstruction>. Vervaeck, Armand, and James Daniell. "Japan Tohoku Tsunami and Earthquake: The Death Toll Is Climbing Again!" Earthquake-Report.com. SOS Earthquakes, 15 Aug. 2011. Web. <http://earthquake-report.com/2011/08/04/japan-tsunami-following-up-the-aftermath-part-16-june/>. Bell, John W. "Las Vegas Valley: Land Subsidence and Fissuring Due to Ground-Water Withdrawal." USGS. 5 Aug. 2013. Web. <http://geochange.er.usgs.gov/sw/impacts/hydrology/vegas_gw/>. "Earthquake Facts and Statistics." USGS.gov. USGS. 11 Mar. 2014. Web. 13 Apr. 2014. <http://earthquake.usgs.gov/earthquakes/eqarchives/year/eqstats.php>. Lin, Rong-Gong, II. "Scientists Pinpoint Origin of 5.1 La Habra Earthquake." Los Angeles Times. 03 Apr. 2014. Web. 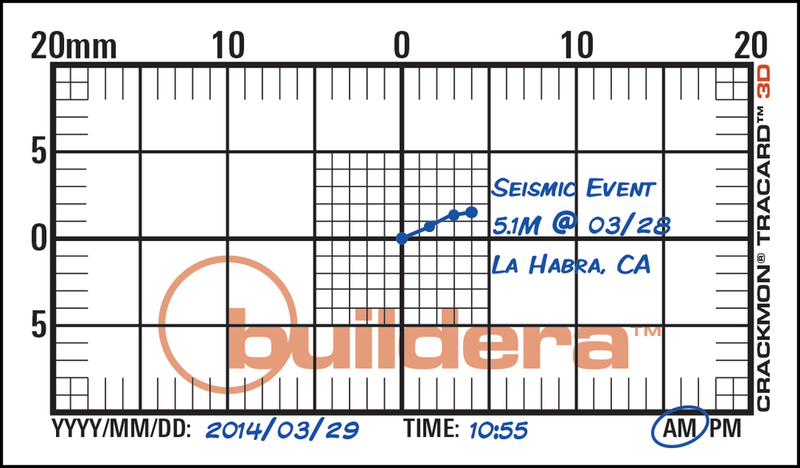 <http://www.latimes.com/local/lanow/la-me-ln-la-habra-earthquake-puente-hills-fault-20140402-story.html>. "The Northridge Earthquake: 20 Years Ago Today." The Atlantic. Atlantic Media Company, 17 Jan. 2014. Web. <http://www.theatlantic.com/infocus/2014/01/the-northridge-earthquake-20-years-ago-today/100664/>. "Buildera CRACKMON® Crack Monitors: Installation Guide and Engineering Specifications CM-IG-90200-00002EN VER 1.2." Buildera. 04 Apr. 2014. Print. "Buildera CRACKMON® 224R Crack Width Comparator" Buildera, 2014. Web. <http://www.buildera.com/crackmon-224r-crack-width-comparator>. "Buildera CRACKMON® TraCard™ 3D Crack Documenting System Data Sheet." Buildera, 2014. Print. Bungey, John H., Michael G. Grantham, Stephen Millard. Testing of Concrete in Structures: Fourth Edition. Load Testing and Monitoring, CRC Press. March 6, 2006. pg 161. Print. ISBN 0415263018.